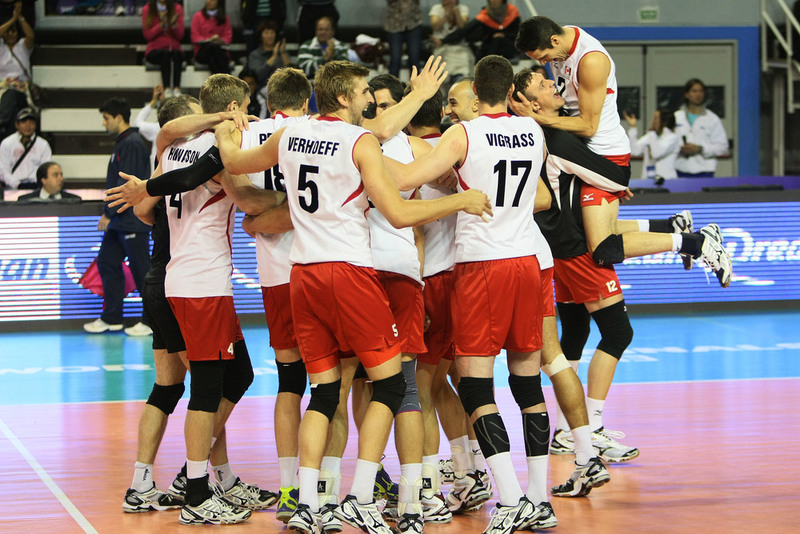 The Men’s National team has never won a NORCECA Championships. They've amassed 16 medals, four silver and 12 bronze, but never once has it been Gold. Winning a tournament with two of the world’s conventional powerhouses striving has never been easy; in fact, the only two teams to ever win a Continental Championships are the U.S. and Cuba. With that being said, here are a few reasons why we think that the 2013 NORCECA Championships could quite possibly be the end of that trend. Let’s face it: Langley knows volleyball. They’ve hosted National Championships at every level. Many times in the past few years have the best 17 and 18 year olds in Canada flocked to Langley for the 18U National Championships. Trinity Western hosted the CIS’s best in 2011, while Columbia Bible College played host to the CCAA in 2012. Sport leaders in the Fraser Valley has made an effort to support volleyball by hosting this marquee events, and they’ve been rewarded with a strong claim that the area is a volleyball hot bed. Trinity Western won back-to-back National Championships with a largely homegrown team of boys from Langley. While in the CCAA, Columbia Bible College took top spot in 2011. The men aren’t the only Champions either, with Fraser Valley University’s women’s team taking the CCAA this past year, while the Fraser Valley Volleyball Club is considered to be one of Canada’s best. Also, have you ever been to a Trinity Western game? They’re home fan-base is unchallenged in the CIS. Some football teams don’t out fans in the seats as well as TWU’s volleyball teams do. The Spartans already have educated and passionate supporters, cheering and chanting throughout the majority of the game. Finally, let’s be honest, the west coast is starved for International volleyball. Sure, they hosted the U23 Pan Am Cup last fall, but isn’t that just kind of a tease? It was a great chance for the people of Langley watch the Spartans dawn the National colours (although, to be fair, most of them already had worn a Canadian jersey), now it’s a chance for those out west to see the real deal compete. People on the coast have been wondering out loud for a few years about when their chance would be to see the National team, now here’s their chance to prove that Volleyball Canada can’t ignore them from no on. We all know the issue with Cuba, it’s no secret. Some of the most athletic volleyball players in the world carry a Cuban passport, but they can’t be kept in the country, continuously being lured into Europe by big contracts. Recently, young Cuban superstar, and National team captain, Wilfredo Leon defected to Poland, causing the Cuban Volleyball Federation to bring down a four-year from the National team. Along with him went Setter Yoandry Diazw. It really was only yesterday that Cuban volleyball was at the top of it’s game, losing to Brazil in the 2010 World Championship Finals, settling for silver, and and fermly cemented in the talks of one of the best teams in the world. That team was led by Roberlandy Simon, one of the most menacing middles in the world, who has not played an International match since then, and is now playing for Italy’s Piacenza. Joining him are other Cuban players who dazzle YouTube watchers like no other. Who hasn’t seen video of Leonel Marshall’s 50-inch vertical? Or Dennis Angel rattling off seven aces in a row for Casa Modena, while Osmany Juantorena is a household name in Italy playing for Trentino. No team has fallen like Cuba has fallen in such a short time, and unfortunately for one of the most decorated volleyball country’s, it’s not likely to get better unless some serious changes are brought to their political system. It’s unfortunate truth that Canada’s always been the U.S.’s annoying little brother when it comes to volleyball. We’ve always been at arms length, narrowly missing them with our fingertips as they laughed about how much bigger they were, but never have we been able to catch up with them for long enough so we could surpass them. In fact, 2013 was the first time since the 1990 World Championships that Canada finished ahead of the Americans at an international competition. It’s only ever happened two other times; in 1989 and 1979, both at the NORCECA Championships. (Note: we did not include the Pan Am Games in this due to the timing of the Games is such that the top athletes are often not present at the Games). But the Americans we’ve come to know and love (or loathe, whichever way you decide to look at it), are no longer the ones on the court. Gone are legends like Lloy Ball and Clay Stanley. The only remaining athletes from their 2008 Gold medal team are Captain Reid Priddy, Sean Rooney, and David Lee. Add Matt Anderson to the mix, and you have the only returning players from the 2013 London Olympics. To prepare for the 2016 Olympics, new Head Coach John Speraw is giving as many players a taste at international play, which means a lot of inexperience in the roster. Huge holes need to be filled by younger guys who have played very little, if any International ball. Look for Murphy Troy to most likely replace Stanley on the right side, with Erik Shoji taking over the libero position from long-time starter Rich Lambourne. While Max Holt played in World League this year, giving him the edge on newcomer Futi Tavana to oppose David Lee in the middle. Where the Americans are most lacking leadership is inrunning the offense. Since Lloy Ball left the team in 2010, the Americans have yet to really find a replacement. For this event, they’re putting the ball in the hands of two kids who are both born in the 90’s: 23-year old Kyle Caldwell, and 20-year old Micah Christenson. Caldwell graduated from UCLA in 2012, and has already found a solid spot in Europe playing for Belgium’s Noliko Maaseik, one of the top European clubs. He was apart of the 2013 World League roster and has already played in a handful of International matches. Christenson, on the other hand, is a name you better get used to hearing. He’s the 2012 AVCA Newcomer of the Year playing for the USC Trojan, while being the only freshman to be named All-American. He led the American Junior National team to a best-ever fourth place finish at the 2011 Junior World Championships, also captaining the team at the 2013 World Championships. Caldwell is our prediction to start for the Americans because of the slight advantage in age and expirience, but regardless which setter spearheads this team, the fact remains that they are unproven and have yet to play an entire season of International volleyball. There’s little doubt that both these prospects will make bid impacts in the years to come but, as of now, the setting position still remains to be one of the Americans weakness. 4. Last but not least: We’re Good. While we’ve focused a lot here on the outside factors, let’s look towards our team, the one wearing the Red and White. Fact of the matter is; it’s very exciting to look at. At the 2011 NORCECA Championships, Canada was inches away from berth in the finals, losing to Cuba in a tough five-setter. Since then, Canada’s team has only improved. To put it in perspective, Canada had just weeks before qualified for the World League, and had yet to play an official match of the competition. Not even a year later, at the 2012 Olympic Qualifier, Canada walked through Cuba, sweeping them in straight, then went on to beat Brazil in World League, and gained valuable experience playing in some of the most hostile territories in the world: Poland and Brazil. The 2013 World League was a breakthrough tournament, not only the fact that they won their pool, but the way they did it. You all probably remember the sinking feeling of watching Portugal beat Canada in Mississauga, leaving the team with a 2-2 record, with Gavin Schmitt sitting on the bench, not in uniform. But then guys stepped up. A big part of it was the bounce-back play of Dallas Soonias and Gord Perrin. Neither were very good in the loss to Portugal; ugly errors at costly times made for tough watching. Luckily for us, they got it out of their system quickly. From then on, the team realized that they didn’t need to rely on Schmitt to put up the numbers. While neither Perrin nor Soonias put up nearly the numbers that Schmitt would, but both attacked with ruthless efficiency. They finished fourth and fifth respectively in World League attacking, both hitting over .500. While both stepped up offensively, the rest of the team stepped up as well, showing everyone that they were able to play the disciplined, systematic, hard working game implemented by Coach Hoag. One major surprise was the play of Langley’s Golden Boy Rudy Verhoeff. He fought his way into the starting rotation, and never gave it away, proving that at give-or-take 6-7, he could compete at the top level with passion and tenacity that was exactly what the squad was lacking. The team bounced back to defeat Korea in two solid matches, and then without looking back, went on the road sweeping both Finland, a team who have never even been .500 against, and Japan where they had yet to lose at home. Canada walked into the gym in Mar Del Plata against the defending Olympic Champion, and won in such an incredible fashion, coming back not only down 0-2 in sets, but also down 2-7 in the fifth, that it seemed like it was made for Disney. Does anyone actually believe that the team wins the match, let alone pushes it to the limit, without the building process that occurred throughout the Intercontinental Round? Hell no. The exponential rise of this team only has a little to do with the quality of athletes. Without a doubt it helps having guys like Schmitt and Soonias who complement each other perfectly on the outside, and watching Gord Perrin grow into one of the most consistent and impressive leftside’s in the world is extremely excited. But the real change in the team has come in the form of belief. The team has started to believe that they belong with the top teams in the world, and the players in the system would follow Coach Hoag to the end of the earth. This team now believes that they can play against the best. This team now believes that they can play dominating volleyball, in pressure situations. This team believes that they deserve to stand atop of the podium at the end of this tournament. This team now believes, and that's the only reason that you should too.